It may sound simple, or even elementary, but any tissue that is not cut in surgery doesn’t have to heal. Further, it is interesting to note that bones themselves have little or no nerve supply. What does that mean to you? It means that if your foot surgeon makes a smaller rather than a larger skin incision, gets right into the bone and remodels and/or repositions that bone, chances are that you will have much less discomfort and can probably return to normal activities (including walking) more quickly than with traditional techniques. Today, all of us know about orthopedic surgeons performing minimally-invasive arthroscopic surgery on knees and shoulders, obstetricians performing minimally-invasive laparoscopic surgery, and even cardiologists and nephrologists performing minimally-invasive surgery on hearts and kidneys respectively. It may surprise you to know that all the research that I have gathered and studied has led me to believe that podiatrists were the first medical specialists to perform minimally invasive surgery. 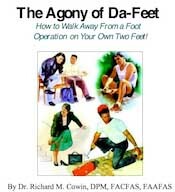 The reason for this as far as I can tell is that back in the 1970′s, most podiatrists were unable to attain hospital privileges to do their surgery. Necessity was the mother of invention and pioneers of The Academy of Ambulatory Foot Surgery developed procedures which could be safely and efficiently performed in the comfort of their own offices at greater convenience and lower cost to their patients. THE FOOT CARE REVOLUTION had begun. Minimally-invasive Foot Surgery is a relatively new way to correct foot problems in which the skin incision (usually less than 1/8 inch in length) is only large enough to introduce special instruments into the offending area. What types of foot problems can be corrected by minimally-invasive foot surgery? Foot problems, such as ingrown and infected toenails, can be corrected without making any skin incision at all. What are some of the advantages of minimally-invasive foot surgery? Since the skin incision is so small (usually requires only a one stitch closure), scarring is greatly reduced. Because of the lack of surgical tissue dissection in this type of surgery, post-operative pain may be greatly reduced. Since minimally-invasive surgery causes less trauma to the tissues of the foot, no pins, wires, screws, or casts are generally required post-operatively. After the surgery is completed, a gauze and tape bandage is usually applied to the foot, and the patient is given a special post-surgical shoe to wear. Many patients are surprised to find that they can return to work and normal activities in no time at all!